Powers: When Billy Berman slams his wrists together, a bright light is emitted, within which his body is transformed into the body of Mighty Man. However, while his body changes from one form to another, his consciousness remains and is in control of the Mighty Man form. The Mighty Man entity has no mind or will of its own. The act of transforming into Mighty Man or Billy Berman sends the inactive body to another diimension – Billy Berman’s form is replaced by Mighty Man’s, and vice-versa. Even though inactive, Billy Berman’s body needs nutrition regularaly in order for his and the Mighty Man identity to survive. Mighty Man has vast super-human strength. He can fly at incredible speeds, has seemingly impeneterable skin, inhuman stamina and endurance, and an accellerated healing ability. He is capable of lifting (pressing) 150 tons. 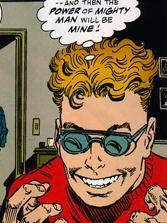 Billy Berman created by Erik Larsen, with help from Keith Giffen and Victor Bridges. The original Mighty Man was one of the first superheroes to debut, back during World War II, and went on to fight against crime over the next fifty or so years. Robert Berman was still active at the age of sixty seven, growing in effectiveness as time passes. With no sign of his grandfather slowing down, Billy Berman sought a way to receive his inheritance. In an effort to expose the hero’s secret identity, Billy Berman leaked the information to the Chicago Voice newspaper. A skilled photographer then captured the transformation of Mighty Man back into Robert Berman, having the image printed in the next edition of the publication. A group of youths then took it upon themselves to murder the elderly man, stabbing him while in his civilian identity. After spending time in Hillman Hospital, the weakened Robert Berman approached death and asked for his grandson. Ann Stevens was merely a dedicated nurse at the time and attempted to ease the suffering of the great man by claiming to be the boy. She was then passed on the Mighty Man powers as Robert Berman passed away. Billy Berman arrived moments after the death of his grandfather, enraged that the old man had died before giving him the Mighty Man role. He was dragged away by two orderlies and the youngster was not seen for years. Billy eventually discovered a device that could allow him to steal the powers of Mighty Man that had been utilized by Dr. Nirvana many years ago. Deciding to follow the current Mighty Man around in order to learn his true identity, Billy discovered that the host was none other than Ann Stevens. He used the weapon created by Dr. Nirvana and stole the powers, becoming the most effective Mighty Man in history, cutting down crime in a matter of weeks. When Freak Force was reformed, Mighty Man caused their reputation to suffer when he slaughters all of the foes that they face. Their rogues’ gallery was all but exterminated in days and after he killed their final foe, the Inhabitor, Freak Force opted to go their separate ways. The new Mighty Man soon began using excessive and even lethal force on any and all criminals, leading to Dragon confronting him about his actions. Dragon was put into hospital, prompting SuperPatriot to gather up a small army of heroes to challenge the boy. During the exchange, numerous captive Vicious Circle members escaped and overwhelmed Mighty Man. A starving Billy Berman ended up dying and passing the powers back to Ann Stevens but the skilled nurse managed to revive him. Billy remains in a comatose state to this day.